This February 2018 release is our largest to date and includes new data types, a new classification system, an entirely new version of the Resistance Gene Identifier, and website improvements. CARD Curation: 37 new ADC beta-lactamases, 21 PDC beta-lactamases, new MCR proteins, 23 rRNA mutations, resistant isoleucyl-tRNA synthetases, hundreds of new resistance mutations, and more. While in past releases all curated AMR mutations were those characterized from clinical isolates, CARD now additionally includes mutations discovered via in vitro selection experiments. Ontological improvements have been made to enable an entirely new classification system for CARD data and RGI results: resistance determinants are now systematically categorized by AMR Gene Family, Drug Class, and Resistance Mechanism. The Antibiotic Resistance Ontology is now additionally available via GitHub, https://github.com/arpcard. Resistance Gene Identifier: Entirely new codebase, compatible with CARD data (card.json) version 2.0.0 and up (download separately). Open Reading Frame (ORF) prediction using Prodigal, homolog detection using BLAST (default) or DIAMOND, and Strict significance based on CARD curated bitscore cut-offs. Addition of rRNA mutation and efflux over-expression models. Hits of 95% identity or better are automatically listed as Strict. All results organized by revised ARO classification: AMR Gene Family, Drug Class, and Resistance Mechanism. Revised documentation, command line menu, and website graphical interface. The Resistance Gene Identifier is now additionally available via GitHub, https://github.com/arpcard. Prevalence, Genomes, & Variants: Expansion of our computer-generated data set on the prevalence of AMR genes and variants among the sequenced genomes, plasmids, and whole-genome shotgun assemblies available at NCBI for clinically important pathogens. CARD Prevalence 2.0.0 is based on sequence data acquired from NCBI on August 28, 2017, analyzed using RGI 4.0.0 (DIAMOND homolog detection) and CARD 2.0.0. Now includes results for protein overexpression models and rRNA mutations. All results organized by the revised ARO classification: AMR Gene Family, Drug Class, and Resistance Mechanism. Download files now include 35000+ genome annotations and all predicted sequence variants. Farewell Arjun Sharma & Suman Virdee! Today we say farewell to Arjun Sharma & Suman Virdee. Arjun joined the lab as a second year volunteer, staying to perform a Biochem 3R06 research project. He has been very active in our Comprehensive Antibiotic Resistance Database project, co-developing our CARD*Shark text mining tools for computer-guided curation of literature in PubMed, pipelines for our clinical isolate genome sequencing work, and developing novel algorithms for predicting glycopeptide resistance from genome assemblies. 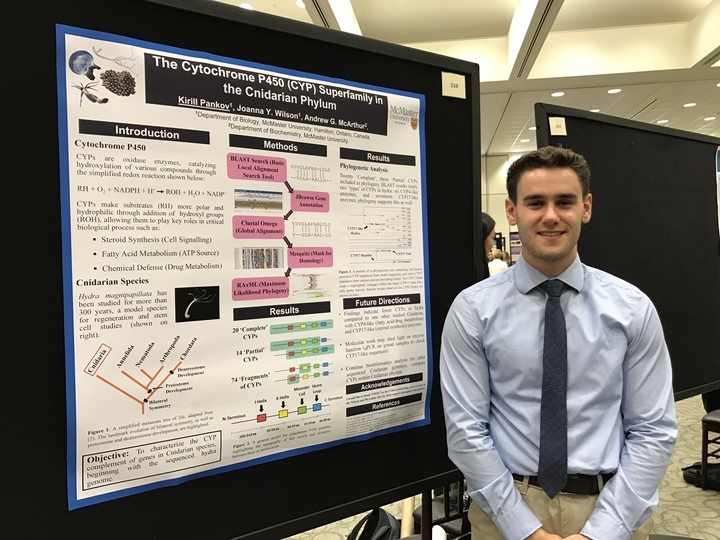 He was the recipient of an IIDR Summer Student Fellowship and leaves the Biochemistry program to enter medical school at the University of Toronto. Suman joined the lab in the 4th year of the Biomedical Discovery & Commercialization program, performing her thesis research on RNA-Seq bioinformatics workflows in a collaboration between our lab and the laboratory of Dr. Kristen Hope (McMaster Stem Cell and Cancer Research Institute), extending her research into the summer by winning a CIHR Summer Undergraduate Research Award. 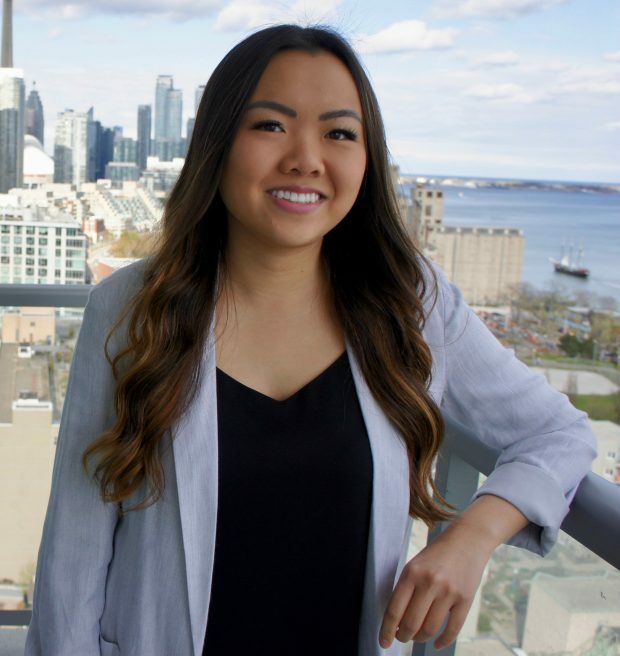 Suman finished her degree and this September starts in the McMaster Master of Science in Global Health program. Bon chance Suman & Arjun! 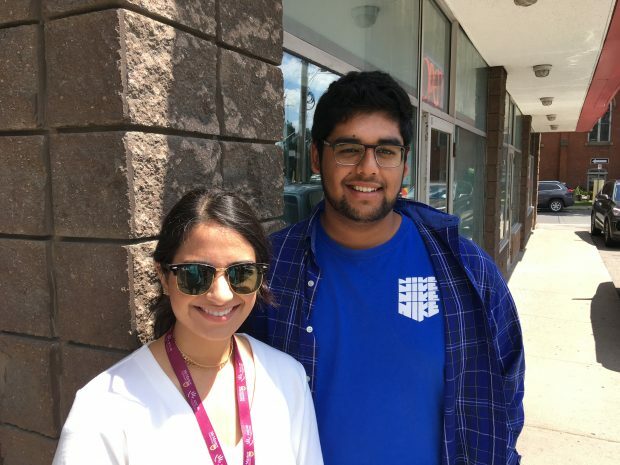 Read more • Comments Off on Farewell Arjun Sharma & Suman Virdee! We haven’t been travelling much this year, but our collaborators have been busy! Dearborn, D.C., A.B. Gager, A.G. McArthur, M.E. Gilmour, E. Mandzhukova, R.A. Mauck. 2017. How to get diverse MHC genotypes without disassortative mating. Presentation at the 2017 Annual Meeting of the Society for Integrative and Comparative Biology, New Orleans, Louisiana. McLean, M., D. Theriault, M. Kelley, B.A. Lago, A.G. McArthur, & L. Williams. 2017. Role of Nfe2 and pro-oxidant exposure in inner ear development in zebrafish. Presentation at the Society of Toxicology 56rd Annual Meeting, Baltimore, Maryland. Williams, L.M., B.A. Lago, A.G. McArthur, A.R. Raphenya, N. Pray, N. Saleem, S. Salas, K. Paulson, R.S. Mangar, Y. Liu, A.H. Vo, & J.A. Shavit. 2017. The transcription factor, Nuclear factor, erythroid 2 (Nfe2), is a regulator of the oxidative stress response during Danio rerio development. Presentation at the Society of Toxicology 56rd Annual Meeting, Baltimore, Maryland. Winsor, G.L., C. Bertelli, K.K. Tsang, B. Alcock, A.G. McArthur, & F.S.L. Brinkman. 2017. Pseudomonas Genome Database 2017: Improved gene/AMR/VF/genomic island annotations, comparative genome analyses, and a platform for facilitating public health genomic epidemiology. Presentation at the 16th International Conference on Pseudomonas, Liverpool, United Kingdom. Read more • Comments Off on Conference Presentations! McArthur AG & Tsang KK. Ann N Y Acad Sci. 2017 Jan;1388(1):78-91. The loss of effective antimicrobials is reducing our ability to protect the global population from infectious disease. However, the field of antibiotic drug discovery and the public health monitoring of antimicrobial resistance (AMR) is beginning to exploit the power of genome and metagenome sequencing. The creation of novel AMR bioinformatics tools and databases and their continued development will advance our understanding of the molecular mechanisms and threat severity of antibiotic resistance, while simultaneously improving our ability to accurately predict and screen for antibiotic resistance genes within environmental, agricultural, and clinical settings. To do so, efforts must be focused toward exploiting the advancements of genome sequencing and information technology. 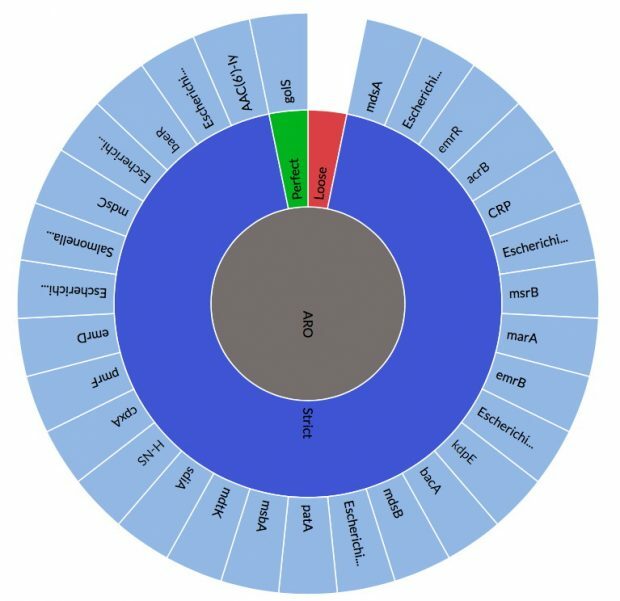 Currently, AMR bioinformatics software and databases reflect different scopes and functions, each with its own strengths and weaknesses. A review of the available tools reveals common approaches and reference data but also reveals gaps in our curated data, models, algorithms, and data-sharing tools that must be addressed to conquer the limitations and areas of unmet need within the AMR research field before DNA sequencing can be fully exploited for AMR surveillance and improved clinical outcomes. Jia B, Raphenya AR, Alcock B, Waglechner N, Guo P, Tsang KK, Lago BA, Dave BM, Pereira S, Sharma AN, Doshi S, Courtot M, Lo R, Williams LE, Frye JG, Elsayegh T, Sardar D, Westman EL, Pawlowski AC, Johnson TA, Brinkman FS, Wright GD, & McArthur AG. Nucleic Acids Res. 2017 Jan 4;45(D1):D566-D573. The Comprehensive Antibiotic Resistance Database (CARD; http://arpcard.mcmaster.ca) is a manually curated resource containing high quality reference data on the molecular basis of antimicrobial resistance (AMR), with an emphasis on the genes, proteins and mutations involved in AMR. CARD is ontologically structured, model centric, and spans the breadth of AMR drug classes and resistance mechanisms, including intrinsic, mutation-driven and acquired resistance. It is built upon the Antibiotic Resistance Ontology (ARO), a custom built, interconnected and hierarchical controlled vocabulary allowing advanced data sharing and organization. Its design allows the development of novel genome analysis tools, such as the Resistance Gene Identifier (RGI) for resistome prediction from raw genome sequence. Recent improvements include extensive curation of additional reference sequences and mutations, development of a unique Model Ontology and accompanying AMR detection models to power sequence analysis, new visualization tools, and expansion of the RGI for detection of emergent AMR threats. CARD curation is updated monthly based on an interplay of manual literature curation, computational text mining, and genome analysis. Read more • Comments Off on CARD 2017: expansion and model-centric curation of the comprehensive antibiotic resistance database. Three of our undergraduate students gave poster presentations in the last month. Arjun Sharma (Biochemistry & Biomedical Sciences 3rd year) outlined his work on developing the Comprehensive Antibiotic Resistance Database’s (arpcard.mcmaster.ca) CARD*Shark text mining algorithms at the Michael G. DeGroote Institute for Infectious Disease Research (IIDR) Trainee Day while Kirill Pankov (Biomedical Discovery & Commercialization 4th year) presented the results of his summer NSERC Undergraduate Student Research Award (USRA) research in the Laboratory of Dr. Joanna Wilson into the origin of Cnidarian P450 enzymes, work he is continuing in our lab as part of his thesis research. 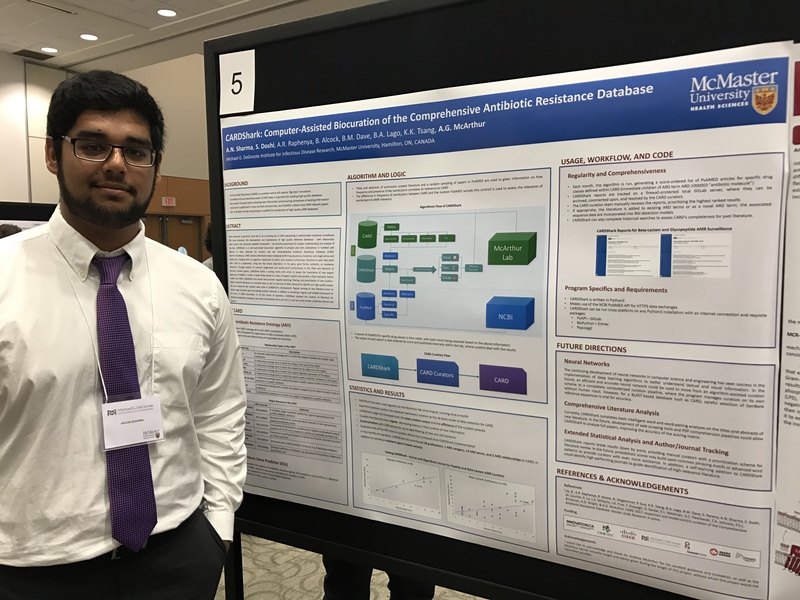 Mohammad Khan (Biomedical Discovery & Commercialization 4th year), a thesis student in the Laboratory of Dr. Eric Brown that collaborates with our group, also presented a poster at IIDR Trainee Day on his work on chemical-genetic interaction database design. Sharma, A.N., S. Doshi, A.R. Raphenya, B. Alcock, B.M. Dave, B.A. Lago, K.K. Tsang, & A.G. McArthur. 2016. CARDShark: Computer-assisted biocuration of the Comprehensive Antibiotic Resistance Database. Poster presentation at the 2016 Michael G. DeGroote Institute for Infectious Disease Research (IIDR) Trainee Day, Hamilton, Ontario, Canada. Pankov, K., A.G. McArthur & J.Y. Wilson. 2016. The Cytochrome P450 (CYP) superfamily in the Cnidarian phylum. Poster presentation at the 2016 Undergraduate Student Research Awards (USRA) Poster Session, Hamilton, Ontario, Canada. Khan, M.A., S. French, B. Aubie, A.G McArthur & E.D. Brown. 2016. Challenging common screening filters through analysis of a chemical-genetic screening database. Poster presentation at the 2016 Michael G. DeGroote Institute for Infectious Disease Research (IIDR) Trainee Day, Hamilton, Ontario, Canada. A cross-national research consortia co-led by McMaster’s Andrew McArthur is receiving two of 16 federal grants to further develop a big data solution to the growing problem of antimicrobial resistance (AMR). The government’s investment, totaling more than $4M, is the result of Genome Canada’s 2015 Bioinformatics and Computational Biology Competition, a partnership with the Canadian Institutes of Health Research (CIHR). McArthur and his colleagues will receive $500,000 over two years. 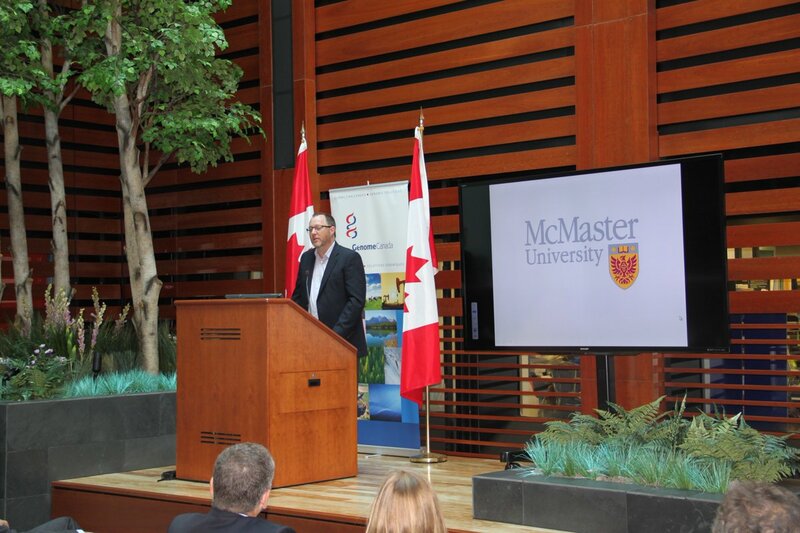 McArthur will work closely with researchers from the University of British Columbia, Simon Fraser University, Dalhousie University and the Public Health Agency of Canada to design and develop novel software and database systems that will empower public health agencies and the agri-food sector to rapidly respond to threats posed by infectious disease outbreaks and food-borne illnesses. McArthur, A.G., B. Jia, A.R. Raphenya, P. Guo, K. Tsang, B. Dave, B. Alcock, B. Lago, N. Waglechner, & G.D. Wright. 2016. The Comprehensive Antibiotic Resistance Database – A Platform for Antimicrobial Resistance Surveillance. Invited presentation at the 2nd Conference Rapid Microbial NGS and Bioinformatics: Translation Into Practice, Hamburg, Germany. Antimicrobial resistance (AMR) is among the most pressing public health crises of the 21st Century. Despite the importance of resistance to health, this field has been slow to take advantage of genome scale tools. Phenotype based criteria dominate the epidemiology of antibiotic action and effectiveness. There is a poor understanding of which antibiotic resistance genes are in circulation, which a threat, and how clinicians and public health workers can manage the crisis of resistance. However, DNA sequencing is rapidly decreasing in cost and as such we are on the cusp of an age of high-throughput molecular epidemiology. What are needed are tools for rapid, accurate analysis of DNA sequence data for the genetic underpinnings of antibiotic resistance. In an effort to address this problem, we have created the Comprehensive Antibiotic Resistance Database (card.mcmaster.ca). This database is a rigorously curated collection of known antibiotics, targets, and resistance determinants. It integrates disparate molecular and sequence data, provides a unique organizing principle in the form of the Antibiotic Resistance Ontology (ARO), and can quickly identify putative antibiotic resistance genes in raw genome sequences using the novel Resistance Gene Identifier (RGI). Here we review the current state of the CARD, particularly recent advances in the curation of resistance determinants and the structure of the ARO. We will also present our plans for development of semi- and fully-automated text mining algorithms for curation of broader AMR data, construction of meta-models for improved AMR phenotype prediction, and release of portable command-line genome analysis tools. Brian Alcock has joined the McArthur Lab to lead curation of the Comprehensive Antibiotic Resistance Database (arpcard.mcmaster.ca). 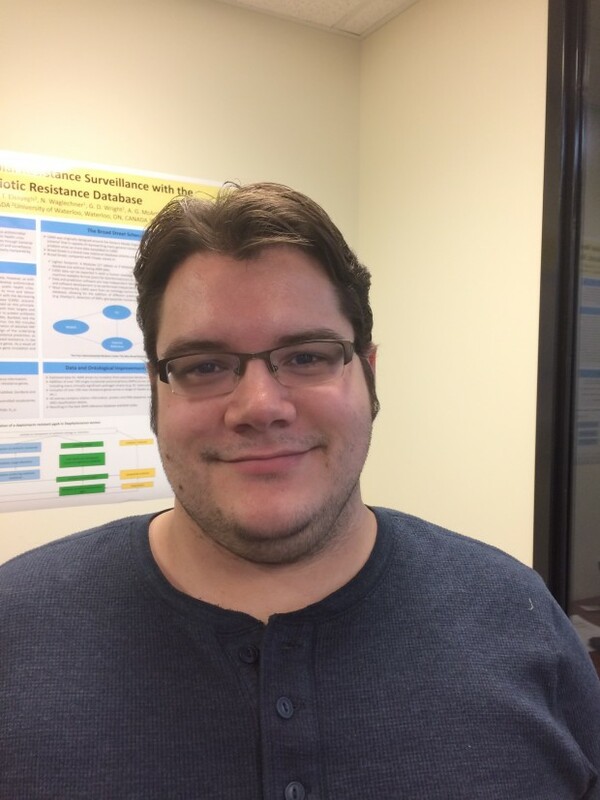 Brian recently completed his MSc in the laboratory of Dr. Ben Evans in McMaster’s Biology Department. Welcome Brian!